This website just came out fresh from the time travel machine! The website is clearly “Classic fun for serious players” –they did a very good job in keeping their word. Anyways, the website design is pretty much too retro for my taste, but I am starting to like it as I try out their games. 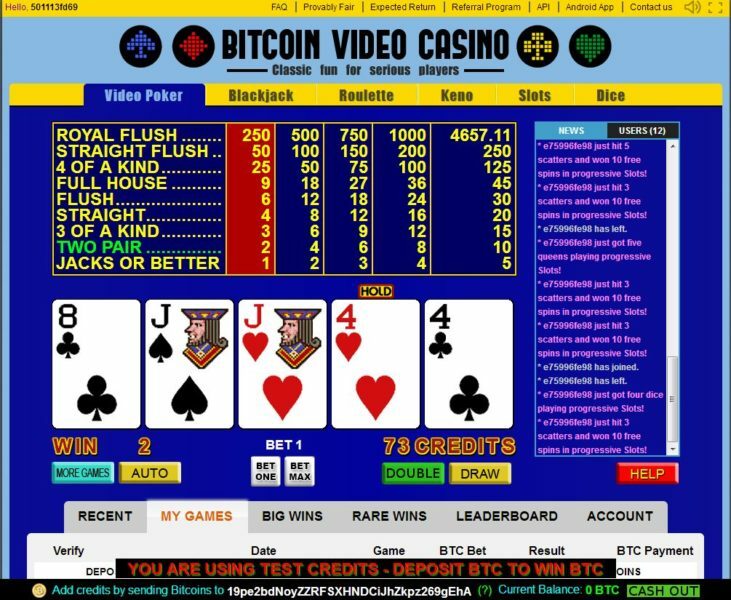 Here are the Video Poker Games that I tried with Bitcoinvideocasino.com. Before you start the game, please adjust your bets by clicking “BET ONE” or “BET MAX” to move the highlighted numbers showing on top of the cards. Once you have everything going, click on DRAW to start the game. Just like any normal video Poker, you are able to hold any card you like from the five cards that will be drawn. Remember, 2 is the wild card in this game. To change the Poker game, you just need to click on the “MORE GAMES” tab located on the lower left side of the page to select a different game to play. 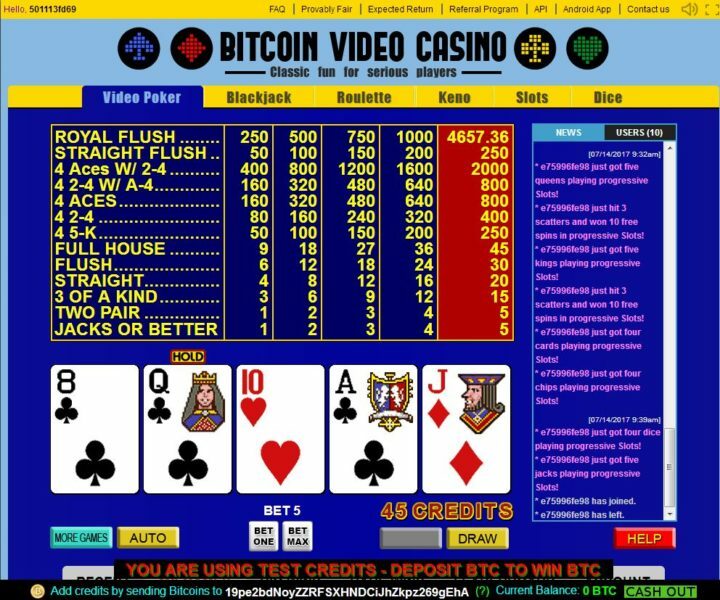 Just like any other video poker games, you need to choose your bet first. You can easily adjust your bets by clicking on the same button which is the “BET ONE” and “BET MAX” for a maximum betting experience. To win in Jacks or Better you need to have a pair of Jacks in order to win. But aside from having a pair of Jacks in your hand, you are also able to win with two pairs, 3 of a kind, straight, flush and a lot more. With Double Double Bonus, it’s just practically the same with the two games I have mentioned earlier. You choose your bets and hit DEAL to start the video poker game. You can also hold the cards can help you win games. In Double double bonus, you get a different set of odds and prizes just like Deuces and Jacks or Better. Provably Fair – It is something that most casino websites today have installed to let the players know that they are using legit probability software and not something that you are going to get robbed with. To read more about this awesome software just click here. 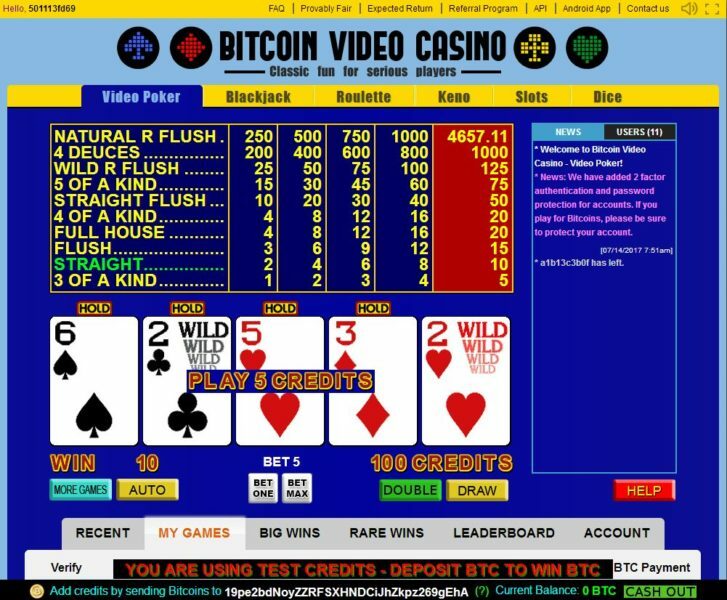 Retro Games – There is actually quite a few games that you can enjoy while visiting Bitcoinvideocasino.com. You have Video Poker, BlackJack, Roulette, Keno, Slots and even Dice! If you do not mind retro-styled video Casino Games then this would be the perfect place. Website – The website as mentioned a few times now is retro-designed and is quite responsive. The last thing you want to have is a “laggy” website that doesn’t respond that well. This website is not that packed compared to any other casino websites that exist out there today. 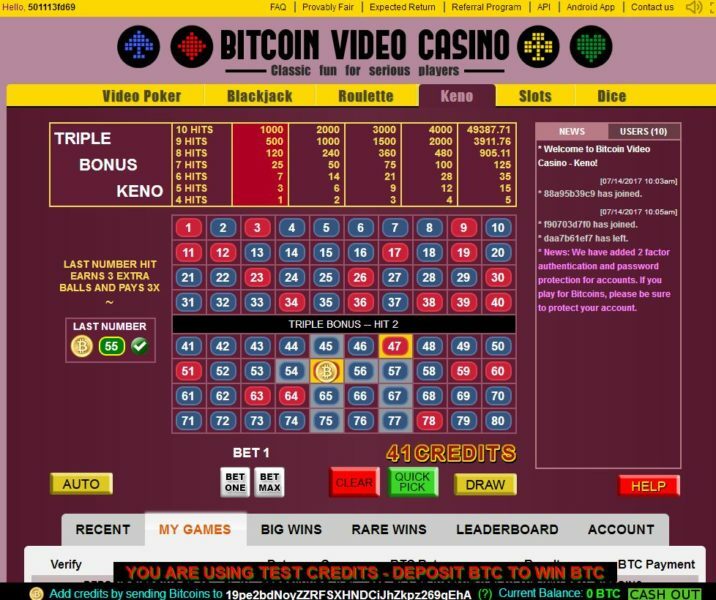 If you want a website that is simple yet has ample video casino games, then this would be perfect for you! Do not expect to have high-resolution graphics or tables as the whole theme of this website is focused on being as retro as possible.